A cool refreshing soup bursting with flavor is perfect on a hot summer day. Especially one that requires no cooking. 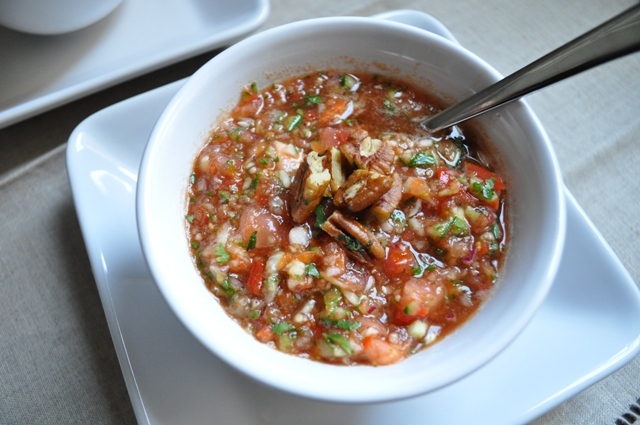 Gazpacho is a delicious chilled vegetable soup that originates from Spain. 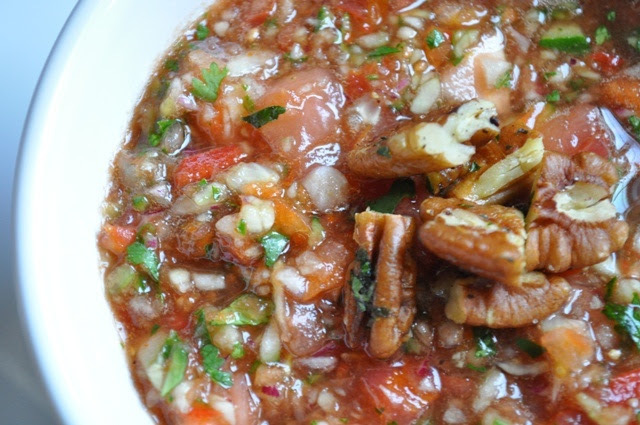 I found this recipe for Summer Gazpacho with a Walnut Twist from Cheap Ethnic Eatz. I had a blast browsing through Evelyn's blog as my first assignment with the Secret Recipe Club! What is the Secret Recipe Club you might ask? It's a very cool online group founded by Amanda of Amanda's Cookin'. Each month the participating food bloggers are each assigned another persons blog in the group to make a recipe from. Everyone posts the recipes they made on the same day at the same time. The cool part it is a secret and you don't know who has been assigned who's blog until the post date. It's a great way to get to know other food blogs, take on new recipes and increase exposure for everyone. If you are interested in joining or just learning more head over the Secret Recipe Club. And don't forget to scroll all the way to the end of this post to see the blog hop linking to what everyone made this month. I have spent quite a bit of time perusing Cheap Ethic Eatz over the past month. Though I'm a big fan of cheap (and delicious) food, I have to admit I'm not overly adventurous when it comes to ethnic cuisines. I guess compared to my mom I'm a word traveler of cuisine, but compared to the truly adventurous, like Evelyn, I'm pretty basic. I like, Italian, Greek, Persian, Lebanese, Japanese, Chinese, Mexican, French (to a certain extent). I'm bit more leery of other types like Ethiopian, Korean, Thai or Indian. The great thing about Evelyn's site is she has a range of diverse dishes. When deciding which recipe to make, I must have changed my mind at least 56 4 or 5 times. Some of the recipes I was debating on were homemade jalapeno hot sauce, aranci (Italian fried rice balls), peach salsa and fig ice cream. In the end I went with Summer Gazpacho with a Walnut Twist. I admit, I played it a little safe by making gazpacho....but I couldn't resist. I came across it when we were in the middle of a mini heat wave here in Southern California and this no cook soup sounded like a perfect accompaniment to grilled mahi mahi I was planning to make. The gazpacho was wonderful and this offered a twist I haven't seen before...topping your soup with herb toasted walnuts. I didn't have walnuts on hand, but I had some pecans and they were a great addition to the soup, adding a nice texture and flavor. The nuts give a little extra heartiness to this very light soup. Hubby is not a fan of nuts so I also did a version with garlic croutons so his soup would have a little extra crunch. And that was delicious too! If you have never tried gazpacho before, I highly recommend it. Thanks for sharing a great recipe Evelyn! Combine tomatoes, cucumber, pepper, garlic, onion, vinegar and tomato juice in a large bowl. Transfer batches of the mixture to a food processor and pulse until coarsely pureed. Transfer pureed soup into another large bowl and stir in salt and pepper, cover and chill in the refrigerator. When serving if soup seems too thick, stir in more tomato juice. Top with toasted nuts and serve. Preheat over to 350 degrees Fahrenheit. 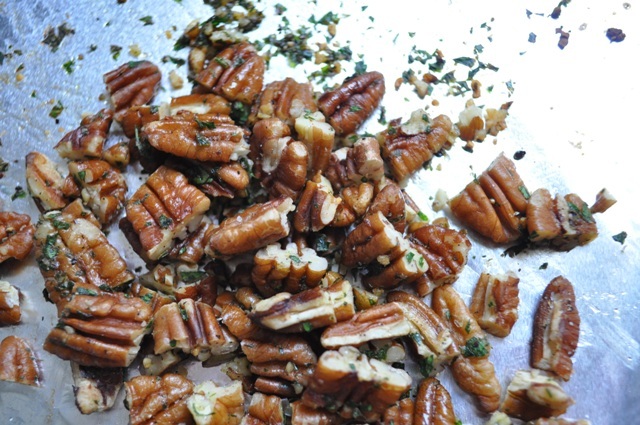 Line a small baking sheet with aluminum foil and toss nuts, herbs, cayenne and salt and pepper with your finger to coat. Bake 5 to 7 minutes or until nuts are lightly toasted. yummmieee..i love this summer gazpacho its very delicious, i have made this recipe on my lumix food processor, when i tasted that its too good i have never eaten such a yummie dish ever in my life. i want to thank you from the bottom of my heart by putting such a good recipe here. I wish I could eat this, but raw onions, garlic, and tomatoes are not my friends! It looks delicious-my husband would love it. On another note, do you know what size scoop I would need for a "normal" size cookie-maybe 2 or 3 inches in diameter? Thanks for your earlier detailed comment!! @Baking Ribbons - The cookie scoops will typically have a number on them (see photo in this post: http://thegingersnapgirl.blogspot.com/2010/12/gingersnaps.html). Some scoops have the # located in a different place (i.e. bottom of the handle, etc). I for normal size cookies I usually use a #40 or #60 size scoop depending on the cookie and how much it will spread. The #40 holds just over 1 1/2 tablespoons of dough. The #60 holds just over a tablespoon. I'm thinking you would want to try #40 for your cookies. Good luck! HA! I found you! Took awhile but but as soon as I saw the title I knew you had picked me :-) Thank you for everything you said about my blog, yeah I jump off the blind edge when it comes to food but I am happy you found plenty of selections to your taste. And what a great choice, it is the perfect summer soup and pecans would be so lovely. Great job, wish I could have a bowl. This looks so colorful and fresh! YUM! I love gazpacho in the summer, and I like how this one has toasted nuts on top - great choice for SRC! I've never made gazpacho! I've been looking at recipes trying to decide which one to try. This is one of the only ones I've seen that isn't blended. I may give this one a try this weekend. Perfect for all of the summer veggies. @Cheap Ethnic Eatz - I loved this soup! We ate it 2 nights in a row. And I will be trying some of the other recipes I came across. ;) Like the fig ice cream since I've seen ripe figs at my local market. And your aranci looked amazing too. Now I know who's blog to go to when I want something adventurous! @Julie - The soup is great and I love that is not fully pureed so you get a nice texture. Good luck with whatever gazpacho recipe you choose. It's a lovely summer soup. I too have so much difficulty choosing a dish to make for the SRC but it's so much fun! One of my favorites! This looks fabulous. Nice work on the Secret Recipe Club. Isn't it fun. I love finding new blogs and reading through them. I love the addition of the toasted nuts. Fab! Glad to be part of SRC with you! 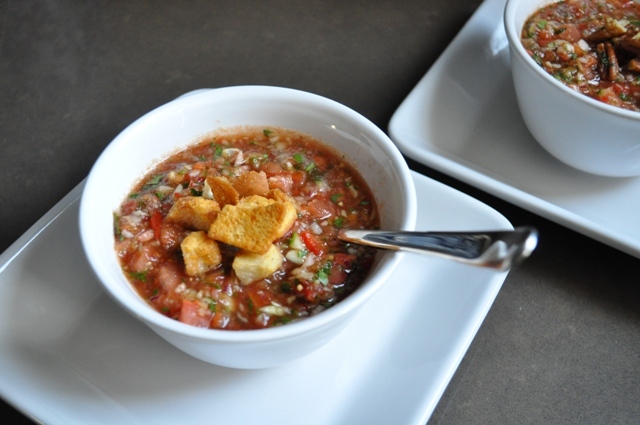 Love those herbed walnuts in this gazpacho! So fun to be in the Secret Recipe Club with you. Looks great! I love toasted walnuts added to the gazpacho! @Amanda - Thanks for the feature on the Secret Recipe Club site. :) This was a great recipe from Evelyn!